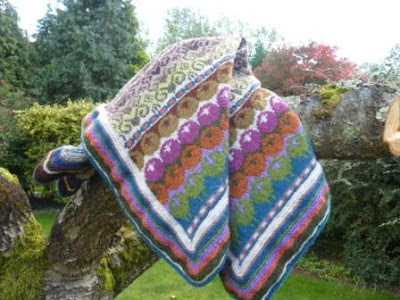 This is a Kate Davies pattern, if that means nothing to you find out about her at http://katedaviesdesigns.com/ - she designs the most beautiful knitted items. 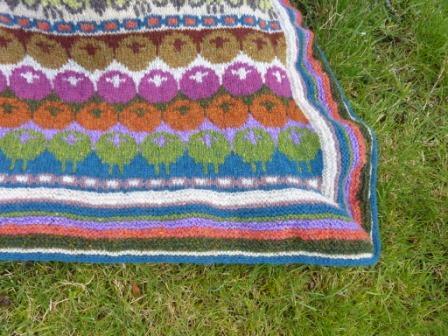 They are, apart from the fantastic designs, a joy to knit as they are so well laid out and easy to follow. When I saw rams and yowes I knew I had to make it. I'd already made 'sheep heid' in (for me) record time. 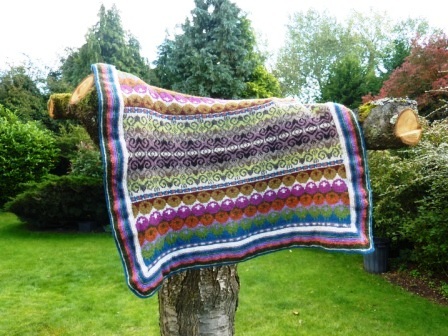 I did this in the natural Shetland colours from Jamieson & Smith the pattern was written for. For 'rams and yowes' I decided to use those up, and a lot of the many, many 'left over from other projects' balls of colourful Rowan (Yorkshire Tweed, Rowanspun etc. etc. ), Jamieson & Smith and Hanne Falkenberg wool I seem to have accumulated. All these are 100% wool and, I felt, were still appropriate for the pattern. I spent a good few hours arranging balls of yarn together on the floor, and then a few more going cross-eyed in front of Excel spread sheets to get the colours to (sort of, I later discovered) work together, and came up with my plan. I did all my rams in natural Shetland colours, my yowes decided they wanted to be colourful ladies, so how could I deny them. ...and picked up the pale purple again in the centre (some of my decisions were based on how much of which colour I had in my stash!). I'm not sure this grey/brown combo really shows off the second row of rams as much as I'd have liked. 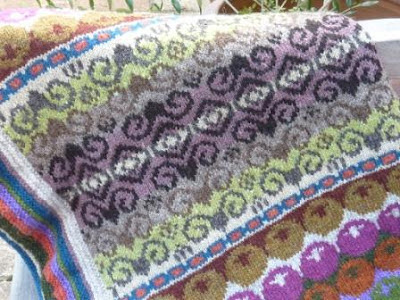 It's also a bit crinkly round the border, which I believe I could fix by going down a needle size the next time I knit it - because I do think I need another one. Here are the yowes again. 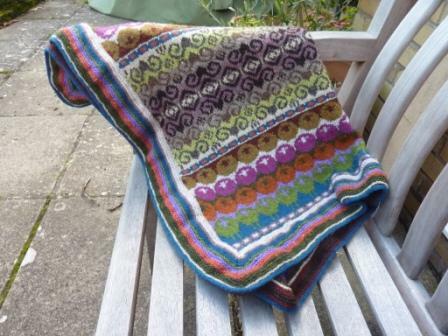 All the time I was knitting it they reminded me of the 'Mo'hairs'* in Margaret Attwood's 'Year of the Flood'. *multicoloured sheep used for growing replacement hair. You should read the book. I am stunned and amazed!! That is a beautiful version of that design.